As you know, the most basic principle of the Law of Attraction is that thoughts have the ability to create. Everything you have and experience in your life today is a direct result of your thoughts. If you want to change your life or have, be or do something you've only dreamed of, all you have to do is change your thoughts. But what if you want to use advanced Law of Attraction techniques? What if you want results to come faster? What if you want the Law of Attraction to be more consistent? What if you want to create lasting change and accomplish more than you ever dreamed possible? You're in luck because there's truly a power within you that can't wait to be released! You can harness it with an advanced Law of Attraction technique called The Mirror Technique. I learned about this advanced Law of Attraction technique in the classic self-help book, The Magic of Believing, written in 1948 by Claude M. Bristol. I'll explain The Mirror Technique to you. With it, you'll feel like you've opened the door to unlimited resources. Many great orators, preachers, actors, and statesmen have used the mirror technique. According to Drew Pearson, Winston Churchill never made a speech of importance unless he made it before a mirror first. Pearson also declared that Woodrow Wilson employed the same technique. It's what I call a supercharging method of stepping up the speaker's subconscious forces so that when he or she appears before an audience, those forces flow out also and affect the listeners. By using the mirror in rehearsing the speech as you are going to deliver it, you are creating a picture of yourself, your words, the sound of your voice, and your sight of the audience, to which the immediate future is to bring reality. By looking into the mirror, you increase the mental vibrations by which the force and meaning of your words will quickly penetrate to your audience's subconscious minds. The mirror technique gives a possible clue to the power and personal magnetism of certain evangelists. I knew Bill Sunday in his heyday and often heard him preach, but in those days, knowing little or nothing about this Mind Stuff, I was puzzled as to how he and other great evangelists were able to influence people to such a remarkable degree. However, we now have proof that Billy Sunday was versed in the use of the mirror technique; it was given by Eric Sevareid in his book Not So Wild a Dream, published in 1946. Mr. Sevareid tells how he – as a young newspaper reporter – secured an interview with Billy Sunday: “He bounded about the hotel room, now peering intently out of the window, with one foot on the sill, now grasping the dressing-table firmly in both hands while lecturing his reflection in the mirror…. 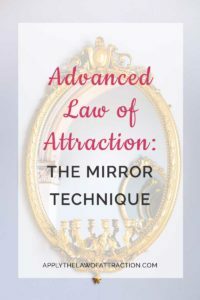 To use this advanced Law of Attraction technique, simply stand in front of a mirror. It should be large enough that you can see your face and torso. Make sure you stand completely straight with your head up and shoulders back. Breathe deeply a few times until you feel more centered and stronger. Look into your eyes and speak out loud to yourself about what you want to be, do, or have. Give yourself the biggest pep talk of all time. Bristol recommends doing the Mirror Technique at least twice a day – mornings and evenings. Mary, you look amazing! You are so trim and healthy. You eat only the best foods because they make you feel the best. You take such great care of yourself. You are an inspiration! Everywhere you go, people compliment you on how great you look. You look better and better every day! You feel so good! You radiate joy, happiness, and only the most positive energy. You are so proud of yourself for being the best you that you can be! Everything comes so easy and naturally to you. You are an outstanding success! This is your life and you're absolutely enjoying it! That's how easy and powerful this advanced Law of Attraction technique is! Hmm, I am pretty good with manifesting things and I TALK to myself in the mirror a lot, but I never quite applied it in the way that you just suggested. I WILL be applying this technique today and seeing how it turns out. It explains why many of my thoughts manifest since i do express myself in front of the mirror, but its never in a way where i’m looking into my own eyes or seeing myself in the place that I want to be. Good stuff! !